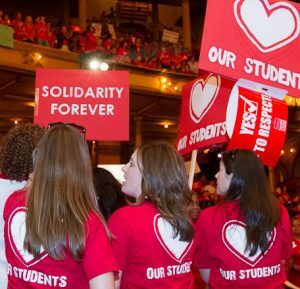 The Executive Board of the Chicago Teachers Union is comprised of the elected officers, committee chairs, appointed members and union staff. It meets each month and is charged with overseeing the work of the union. One of its main tasks is to propose the agenda for each monthly House of Delegates meeting. The E. Board also votes to recommend Items for Action at the House of Delegates, many of which are put forth from the union’s standing committees and their subcommittees. The elective officers of the Union shall be: President, Vice President, Recording Secretary, Financial Secretary, six Trustees, three Area Vice Presidents, and a Functional Vice President for each one thousand Union members, or major fraction thereof, in each of the following groups: elementary teachers, high school teachers, and career service employees, provided that each of these groups shall have at least one Vice President. The membership in good standing for December 31 preceding an election shall be the determining figure. Below are pictured the Trustees, Area Vice Presidents and Functional Vice Presidents (FVPs). The four major officers can be seen on the About CTU page of this website. The Executive Board shall consist of all the elected officers as specified in Article V of the Constitution; two (2) members of the Union’s delegation to the Chicago Federation of Labor chosen by the President, a Functional Vice President of Retired Members who shall be elected by that group; any member of the Union who is a major officer of the American Federation of Teachers or the Illinois Federation of Teachers; the chairpersons of Chicago Teachers Union’s standing committees and the Editor of the official Union publication. 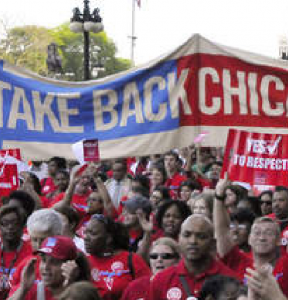 The above described officers of the American Federation of Teachers and Illinois Federation of Teachers, the chairpersons of standing committees, and all members of the Union’s professional staff shall have the right to the floor in Executive Board meetings but not to a vote. Below are photos of the non-voting, non-staff members of the Executive Board.